Overhead door closer for general applications, fixed power size 3, suitable for doors up to 60kg and/or 950mm wide. Size 185 x 44 x 66mm. CE Marked & Certifire Approved. Figure 1 fitting, supplied with Figure 66 bracket. 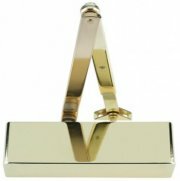 Available in Silver, Gold or Black finish. 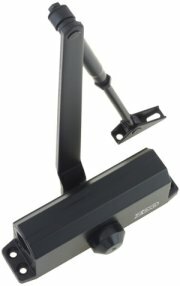 Black overhead door closer for general applications, fixed power size 3, suitable for doors up to 60kg and/or 950mm wide. Size 185 x 44 x 66mm. Brass overhead door closer with variable power size adjustment 2 to 4, suitable for doors up to 80kg and/or 1100mm wide. Size: Length 252mm, Width 67mm, Depth 54mm. Figure 1 fitting, parallel arm Fig.6, transom Fig.61 applications. Overhead brass door closer fixed power size 3, suitable for doors up to 60kg and/or 950mm wide. Size 178x42x64mm. 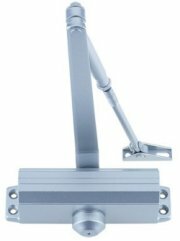 Overhead door closer with variable power size by template 2 to 4, suitable for doors up to 80kg and/or 1100mm wide. Size 207x55x40mm in silver finish. Overhead door closer with variable power size by spring adjustment 2 to 4, suitable for doors up to 80kg and/or 1100mm wide. Size 207x55x40mm in silver finish. Supplied with backcheck as standard. Concealed chain spring door closer, recommended for internal doors, they are fitted into the door edge, with the chain plate attached to the frame. When the door is opened, the spring recoils and forces the door to shut. Chain tension can be adjusted allowing a good degree of flexibility in setting the door closing rate. Square and Radius end version available. Fire tested. Fire certificate BS476:PART 22:1987. Comes with a 10 year mechanical guarantee. Faceplate size 45mm x 25mm, suitable for doors upto 45kg. Main casing is 170mm long and 59.4mm high. Anchor plates are 123mm long and 25.5mm wide.